USB C to HDMI + VGA, CableCreation USB Type C (Thunderbolt 3 Compatible) to HDMI 4K+VGA Adapter, Compatible MacBook Pro/Chromebook Pixel/Dell XPS 13/Yoga 91, Black, 20CM | Replicafer Co. VERY IMPORTANT: ★ Please bear in mind that you can Only connect to 1 external monitor at a time. 1.In order to enjoy the 4K high resolution, please make sure to use a 1.4 or higher version HDMI cable, and 3+9 VGA cable. 2.If the resolution of your laptop is higher than the external monitor, please go to Windows Menu--> Setting--> Display--> Advanced Display Settings, set your laptop's resolution same as or lower the resolution of external monitor. 3.If it does not work, you can go to the official website of your laptop, update the BIOS and graphics driver, and try again. 4.If you have a MacBook or MacBook Pro runing macOS, when you first connect this adapter, you can go to Apple Menu-->System Preferences-->Displays to get extend or mirror function. 5.If two outputs are connected, then only one output can receive the input signal, The priority sequence is: HDMI, VGA. ★ Please bear in mind that you can Only connect to 1 external monitor at a time. This is a USB-C to HDMI and VGA (DP Alt Mode) Adapter. Support plug and play. It allows you to transmit signals from a USB-C source to a high definition HDMI or VGA display (TV sets, projectors, etc). USB-C to HDMI and VGA (DP Alt Mode) Adapter can work on the iMac 2017, MacBook Pro 2017 & 2016, MacBook 2015, New Chromebook Pixel, Dell XPS 15 & 13, Yoga 910 & 900 and more USB-C supported laptop, but NOT compatible with MacBook Pro 2018. USB-C Input: Enables reversible plugging and provides total compatibility with the newest computers and devices. What You Get: CableCreation USB-C to HDMI Adapter, user manual, worry-free 1 year warranty and friendly customer service. If you have any concerns at all, please don't hesitate to email us. USB 3.0 to HDMI 1080P Converter Cable, QICENT External Video Card Multi Monitor and HDTV Converter for PC Laptop Windows 7/8/10 (Black) Driver Needed! 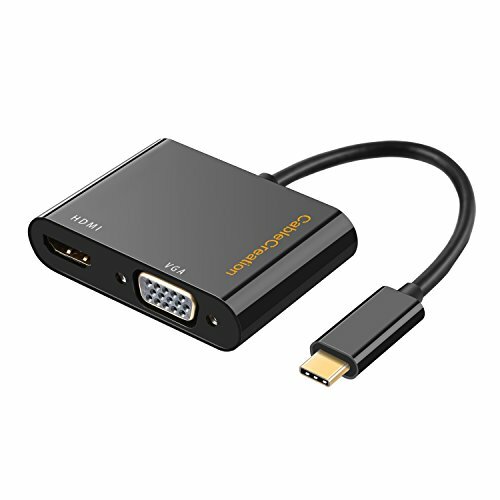 USB 3.1 Type C to Mini Display Port Adapter–Easily use a Second Display and Monitor for Apple Macbook Chromebook Pixel–LESVIEO USB C to Mini DP Cable-4k+Type c input support Thunderbolt 3 Compatible.